You may think that corrosion in structures is a just a durability-related issue in the first glance. Well, that is far from the truth. In fact, corrosion can directly affect mechanical and structural properties of components. Corrosion can affect the global response of the structure. 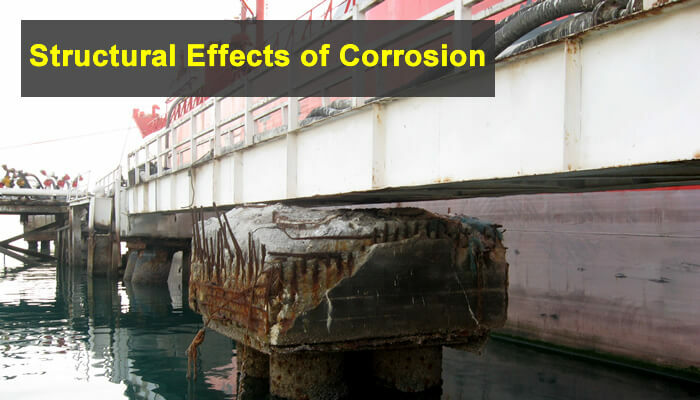 In this article, we will review some of the main structural effects of corrosion on steel structures and reinforced concrete structures. Before we begin, let’s review the basics in corrosion science. Corrosion is a chemical process, in which refined metals – steel in our case – revert back to their lower energy, more natural and stable state of ore (iron oxides in our case). The phenomena is scientifically explained with the Law of Entropy. The reaction happens with losing steel material and producing red rust, which is generally 4 to 7 times larger in volume. Corrosion reduces the effective cross section of structural components. This will reduce the axial, and flexural strength of elements, and makes them structurally weak. Even if corroded elements look stable, it does not mean they are safe; in fact, the corroded structures become vulnerable for design loads (ultimate loads), i.e. a strong ground motion can increase the stress actions beyond the capacity of the sections. Loss of strength can happen in steel and reinforced concrete structures. Corrosion under insulation -CUI- is a frequent observation in refineries, and oil and gas industry. Steel sections covered under fireproofing insulation experience corrosion over their service life. Another famous example is the reduced flexural, and shear capacity of the RC element. Du et al (2005) developed a mathematical model for the residual area and strength parameters (such as yield strength). This formula described the residual area based on the corrosion rate. Another structural effect of corrosion is on the fatigue strength of steel elements, connections, and RC elements. 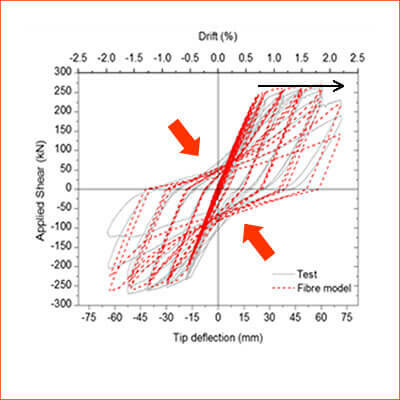 Corrosion may accelerate fatigue crack propagation in structural steels. Development of pitting corrosion introduces additional points of stress concentration at which cracking may develop, which will reduce the fatigue strength. Apostolopoulos (2006) studied the effect of corrosion on high and low cycle fatigue of reinforcing steel. The capacity of composite elements such as RC elements depends on the characteristics of concrete-rebar interface. When steel corrodes, the products of corrosion expand. This will leave a poor quality steel layer over the surface of the reinforcement. This layer has a poor bond with surrounding concrete; therefore, it will reduce the capacity of the section. In case of lap splices or anchorage, this may reduce the effective length of anchorage, and resulting in premature failure of sections. Stanish (1997) studied the effect of corrosion on the bond strength in RC elements. Corrosion can significantly reduce the ductility of RC sections. This is critical in seismic design and evaluation. Corroded sections have lower ductility, which means their plastic deformation is limited. This will affect the seismic response of the elements. Corrosion of reinforcement in the lap splices will affect the load transfer in the laps, preventing the to develop yield stress. Asri and Ou (2011) studied the seismic response of corroded bridge columns by nonlinear pushover analysis. Corrosion can reduce the effective cross sectional area of transverse reinforcement in beams and columns, and reducing the shear capacity of the section. In concrete slabs, this can reduce the shear strength of the slab close of the columns, and increasing the chance of punching shear failure. In footings, the corrosion can result in shear failure of the footing, anchorage failure, or flexural yielding of steel reinforcement. This entry was posted in Corrosion, Inspection and Evaluation and tagged Concrete, Strength. Bookmark the permalink. You can have corrosion proof for the price of corrosion prone and at the fraction of corrosion ” resistant”. GFRP rebar is commonly used in Canada as primary reinforcement. It unmatched durably and low cost compared to stainless makes it the only corrosion-proof reinforcement. Even stainless corrodes. Using stainless steel rebar where needed only; edges and exposed zones, as well as in joints, is a solution that has proven to be efficient and currently used by leading consultants. I guess corrosion resistant rebars and stainless steel rebars would be costly solutions. Wouldn’t it be easier and more cost effective to seal concrete surface to prevent possible surface cracks and any micro size openings which would expose steel rebars to air which starts to corrosion reaction? Coatings are one effective way for the maintenance of these facilities. Best way to eliminate all corrosion mechanisms in Concrete is to prevent concrete from absorbing water, sealants & coatings are not effective & require annual Maintinance, producing Hydrophobic & pore blocking (HPI) Concrete is the Best time proven method. Poorna – your suggestion is out of the box and would be the best and cheapest solution in terms of construction – time as well as cost effectiveness. However, at the present time when construction practices, in the Indian context , wherein the cover for the reinforcement is enhanced to nullify the permeability of the corroding environment has been the effective solution as it is a question of affordability and cost effectiveness. Unless it is a project of substantial cost how often do we use an Engineer to guide let alone supervise the needs/requirements of the end user/client? Often the skilled tradesman is relied upon to resolve the issues. As a compromise and on the question of reliability is adviseable to have the external reinforcements closest to the aggresive environment done with SS (there are doubts expressed on this) or coat the reinforcements with an anticorrosive paint like solution before placement – but this should be after the cutting and bending of the reinforcement bars (labour oriented). The whole problem now is being overcome with the use of GFRP reinforcements – said to be cheaper substitute and obviously non-corrosive. Almost all the parameters discussed ain the blog like strength, bonding, ductility, fatigue, shear capacity etc are addressed and the deficiencies obliterated. Using stainless steel is getting more and more popular, and provides a longer durability. This is not a simple topic to conclude in few words. There is material, construction / constructability and service exposures to be considered for each project and member. Some segments or some exposures can only be built by stainless steel for longer service life, some others can be combination of multiple options, higher strength, exposed surface stainless steel or sealers. If nothing is manageable to maintain service of structure than corrosion protection. GFRP is a corrosion proof reinforcing product. All other forms of steel including Stainless Steel will eventually move to a state of least energy; hence will degrade / oxidise, increasing thier vulnerability to the same corrosion characteristics listed in this article. GFRP remains significantly cheaper in most places in the world and is well known to be significantly (50%) more carbon efficient. The surface preparation will only ‘protect’ while active, and while within the boundaries of crack width tolerances. Should a crack be created by traumatic events a GFRP reo will retain its corrosion proof characteristics. Its important to note that corrosion occures not only in reinforcement rebars (Chloride Attack), others forms of corrosion occures in concrete, such as Sulphate Attack to cement paste, Alkali – Silica reaction, Delayed Ettringite Formation, Freezing & Thowing…etc all of those have one common denominator, which is WATER, keep water out of Concrete and you’ll have a durable & corrosion free Concrete for the service life of the structure. Great information.Corrosion is a dangerous and extremely costly problem.The most common kinds of corrosion result from electrochemical reactions.Some metals acquire a natural passivity, or resistance to corrosion. This occurs when the metal reacts with, or corrodes in, the oxygen in air. This article is very informative and it is really nice to know about rebar too, Thank you for sharing this. Keep sharing such things and updating us.